Congrats to both of you. I will email your subscription details soon. Have fun with fotolia. For those of you interested in knowing how I chose winner names 'randomly', here is the secret. It's pretty simple actually. Write down the names of all the candidates in excel sheet from top to bottom. Then allot them serial numbers. Assume there are 5 candidates (as below). You now need to generate a random number between 1 and 5. 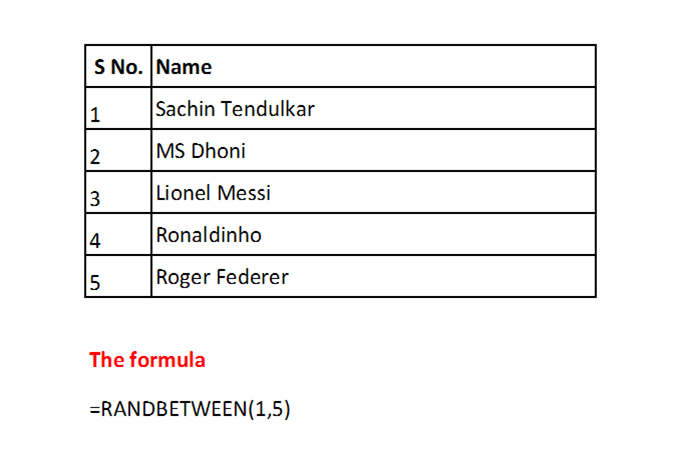 Type this formula in another cell =RANDBETWEEN(1,5). Press enter and a random number will be generated. If 3 comes, then Lionel Messi is the winner. 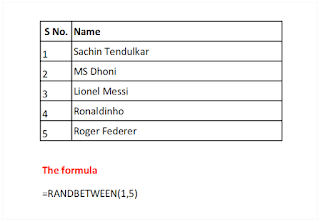 Type the formula again and press enter, it will again generate a random number between 1 and 5. It's that simple. Then let me ask you a question. What happens if we do =rand() in MS PowerPoint? Don't know? Then open a text box and type this. See what happens. Play with randomness. The quick brown fox jumps over the lazy dog. The quick brown fox jumps over the lazy dog. The quick brown fox jumps over the lazy dog. The quick brown fox jumps over the lazy dog. The quick brown fox jumps over the lazy dog.